One of the ways I become a better eLearning designer is by finding good examples and trying to replicate the elements I like. Recently, my friend Brooke Schepker from Yukon Learning shared a sample course. There are a lot of great ideas that you can apply to your designs. I’ve included some video lessons and source files that highlight my favorite parts and should help you build them yourselves. For the most part, compliance courses are what give eLearning a bad name. They’re usually dreadfully boring and poorly designed. 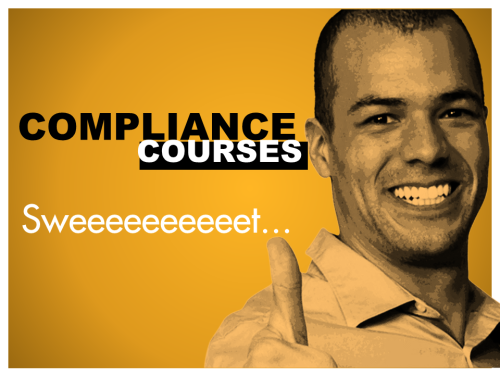 Yukon was bold in selecting a compliance course as an example and kudos to them for showing us a better approach. In my opinion, the two design elements that make it stand out from a typical compliance course are: storytelling and a scenario-based approach. Instead of walking us through the information using bullet points (like most boring compliance courses), Yukon used 3 short and realistic stories that contained the elements of harassment. 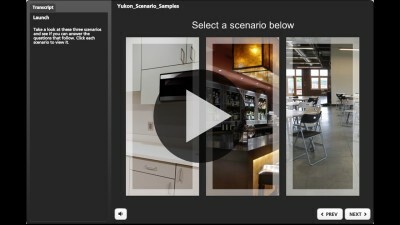 Rather than present the scenario on a single screen, Yukon uses conversations to deliver the context of the scenario, then inserts challenges along the way. You are forced to stop and think, rather than passively watching. Once you’ve made a choice, you get custom feedback based on your selection. Brooke mentioned that as designers, they always ask themselves “‘would this information be better told or discovered?’ This question challenges us to think of ways to allow the learner to ‘uncover’ the importance of the topic as opposed to us just covering it in the course.” I personally like the use of discovery in these scenarios. What you’re doing is actually mixing together a conversation with an eLearning scenario. When I shoot backgrounds, I usually do it with nobody in the background. But that can make it look a little bit like a ghost town, and not like a space that’s being used. If you check out what Yukon did here, you’ll see that there are several people in the background. It’s actually just a few other characters that they’ve inserted to make it seem like the space is actually being used by people, and isn’t a ghost-town. View the video tutorial (source files included). I have a tendency to create a lot of 2-person scenarios, which Yukon did nicely in the 2nd and 3rd scenarios. But, it was interesting to see the use of 3 people in a conversation in the 1st scenario. I thought the angle of the characters still worked really well. I have a short lesson, including source files, on how to create a 3-person conversation. Stop motion is a really easy effect to use in any tool. Below is a lesson, with source files, on how to use stop motion to create a video effect with still photos. Even though this seems minor, as a user, I like the idea that I’m in control of where I go and what I do in the training. I like that I could complete the scenarios in any order that I wanted. So many courses have locked navigation and force the learner down a single path. That’s really not what users like. In this example, it was as simple as building an intro screen that hyperlinked to one of 3 branches, then returned the learner to the main screen. If your concern with open navigation is that you won’t know if learners completed all 3 sections, check out how the intro screen actually changes to the status of each of the 3 sections to “complete” when the learner completes that section. Yukon used the power of Articulate Storyline 2 with variables and states to track the status. Well done! How do you make your courses more engaging? Are you using any other techniques to make your courses engaging and interactive? Are there any other video tutorials you’d like me to create about the Yukon course? Yukon Learning’s mission is to “Make e-Learning Easy for Everyone” by providing certified Articulate training, custom course development, and engaging simulations. Plus, they’ve changed the game with Rapid Course where you “Buy the Course, Get the Source.” You can see more of Yukon Learning’s work here. Yea the people in the scenes are kind of cool, but you do need to work on the interface and the colors, especially with the question scene and the typography. Also I can also see some of the green screen around some of the people and they look a little blurry. I really like this a lot Bryan. Have you ever considered providing some tips on creating some gaming elements for eLearning? Personally, I want to use more and often do not have a lot of time to do anything “whiz bangy.” Can you offer any advice? My team uses Storyline. Just curious. Thanks!